HOLMES BEACH - It has been an absolute nightmare for some condo owners. Back in September, Hurricane Irma badly damaged a lot of the units. Now it appears that work is finally being done on fixing them. In all 10 condos were extensively damaged by large amounts of water when the hurricane ripped the roof off the two story building, making it uninhabitable. Barry Garland lives right next door to the condos. He tells us one of his friends lost a lot because of this. "Right after the hurricane, we didn't get out here until a couple of days later, he came down about a week or so later, you couldn't even go in the place it smelled so bad," said Garland. More than four months have passed and neighbors say it looks like work is finally getting underway on the condos by Accutech Restoration of Sarasota. A Holmes Beach building official says an emergency permit was issued on September 21st which gave full authority to remove insulation, drywall and other materials, so there should not have been this long delay. A possible issue regarding FEMA's 50 percent rule could have played a factor in the delay. That rule requires a building be elevated and brought into code compliance if repair costs exceed 50 percent of the structure's value. Some residents at Cayman Cay are still waiting for repairs months after Hurricane Irma. "They're over there and I'm over here and I don't understand why it's taking so long," said Garland. One of the condo owners says there has also been an issue with insurance companies and who is going to cover the cost of the repairs. Damage to the condos runs in the hundreds of thousands of dollars. 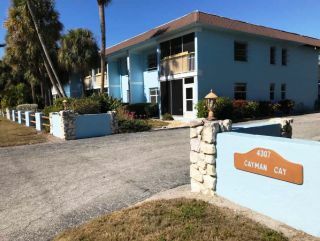 The Holmes Beach mayor as well as the property management company overseeing the Cayman Cay Villas declined to comment.